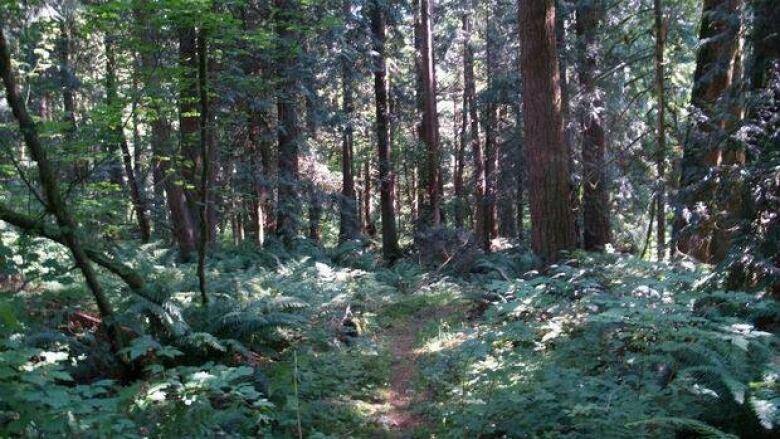 Some residents in the Township of Langley, B.C., are fighting to save a 25-acre forested parcel of land. The township is trying to sell the land, located along 84th Avenue, to raise the money to buy an old school in Aldergrove, which would be converted into a pool and other recreation facilities. But those who live nearby say the land is too valuable to sell — and they're collecting signatures for the cause. "That's a rare, densely covered area of 100-year-old-plus trees, and it's a beautiful area, and we'd like to have it protected as a park," said resident Stuart Bucholtz. Bucholtz, who has lived down the road from the forest for 37 years, said the land needs to be preserved. "There's beautiful walks in there amongst real large conifer trees and mixed deciduous trees," he said. "It's an absolutely beautiful area, and anyone who comes in there immediately recognizes that that's the case." Coun. Bob Long says there are no plans to destroy the forest by selling it. "We felt that these properties were ideal for country estates," he said. "I don't think it should be assumed immediately that people are going to clear-cut them or destroy the land. I think our idea is to sell them to people that are going to enjoy them." Long said neighbours have gone too far in launching a petition to save the forest. "It is a bit of a surprise that we've reached this opposition, especially considering we conceded on the other properties that we're not going to sell as a result of the public outcry," he said. In July, council reversed a decision to sell another parcel of forest, at 84th Avenue and 252nd Street, following a similar outcry. The land is now being preserved as an official park.